Is it possible that the ALA Youth Media Awards press conference was two weeks ago? I have not stopped smiling since we called Kate, Holly, Kevin, Amy, and Vince to share good—no, great—news. Today's special guest is Holly Black! Congratulations, Holly! Holly Black: I was asleep when the phone rang, because I had been up until five with a fussy baby, but I remember having two distinct thoughts: 1) Could this really be happening? 2) Please don’t let my 8-month-old wake up! The whole thing was amazing and really surreal and the chorus of laughter and cheers on the other end of the phone only made it more surreal and amazing. After I hung up the phone, I danced around the room and then the phone rang again (my editor) and my husband realized that he and the baby better go to the guest room if either of them wanted any sleep at all. Holly Black: When I was a kid, the Newbery always meant the good books, the ones with the shiny stickers that were standing up in the library. The Newbery meant Charlotte’s Web and The Witch of Blackbird Pond, The Cricket in Times Square, Wrinkle in Time and A Ring of Endless Light, The Black Cauldron and The High King, The Dark is Rising and The Grey King, The Egypt Game, The Mixed-Up Files of Mrs. Basil E. Frankweiler, Mrs. Frisby and the Rats of NIMH, Bridge to Terabithia and The Westing Game, The Blue Sword and The Perilous Gard, all books I loved and read enough times that their covers were tattered, spines broken and pages curled. It’s a bit strange to reconcile my idea of the Newbery with my idea of one of my own books receiving a Newbery Honor. I’m still working on that. Reading is an opportunity to understand the world and ourselves better by trying on characters who are like and unlike us in situations that are both familiar and unfamiliar. Holly Black presented at the 2013 National Book Festival. Holly shares how she came up with her last name. Holly Black and Tony DiTerlizzi presented at the 2009 National Book Festival. I am giving away one copy of Doll Bones. 1. It will run from 2/10 to 11:59 p.m. on 2/11. 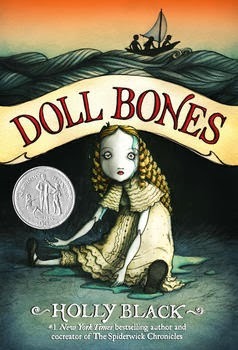 Borrow Doll Bones from your school or public library. Whenever possible, please support independent bookshops.